DTC and cluster scheme buses, have been readied for acceptance of Delhi Metro smart card as a mode of payment for purchasing tickets. Delhi transport app which brings all services on single platform is awaiting a launch. 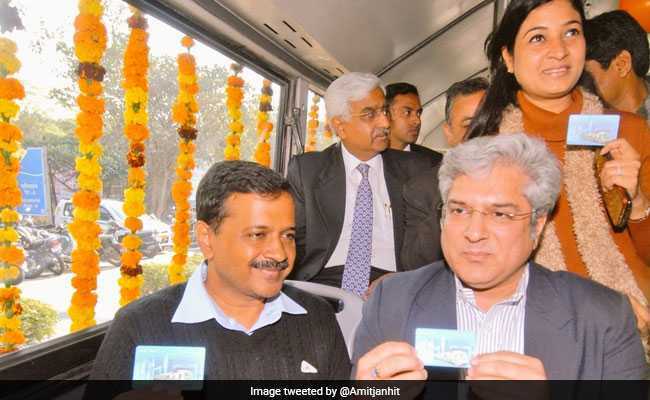 The formal rolling out of common mobility card scheme and the multi-functional transport app has been delayed due to a "tussle" between Delhi transport minister and the department's top officer, an official claimed. DTC and cluster scheme buses, have been readied for acceptance of Delhi Metro smart card as a mode of payment for purchasing tickets. Electronic ticketing devices for 1,650 cluster and 3,965 Delhi Transport Corporation (DTC) buses have been equipped with secured access module chips for swapping of smart cards of passengers, officials said. "A formal roll out of the common mobility card is awaited as efforts are being made to fix a date for it. The matter has become difficult due to a tussle involving the minister and the transport secretary," the official, who did not wish to be named said. Delhi Transport Minister Kailash Gahlot and Transport secretary Varsha Joshi were engaged in confrontation over procurement of new buses and alleged corruption at Burari Transport Authority office. A few days back a forum of transport department associations accused Mr Gahlot of "misbehaving" with Mr Joshi and sought his apology. The trial for common mobility card was started in 100 buses in September last year. Again in January, trials in 250 buses were launched by Chief Minister Arvind Kejriwal. It was said that the scheme will cover all buses by April. Bus conductors have been trained for issuing tickets to passengers using smart cards. But the number of passengers using their metro smart cards for buying bus tickets is very low due to lack of information. According to Delhi Metro Rail Corporation (DMRC) daily ridership has gone up to 28 lakh in recent days. Around 80 per cent of these commuters use smart cards. DTC buses carry over 32 lakh passengers every day. Also, the Delhi transport app, which aims to bring all services of the transport department in a single platform, is awaiting a formal launch. "The app is ready for launch but a nod from the government is awaited for this," a transport department official said. Mr Joshi had tweeted earlier saying the chief minister has been requested to launch the app.